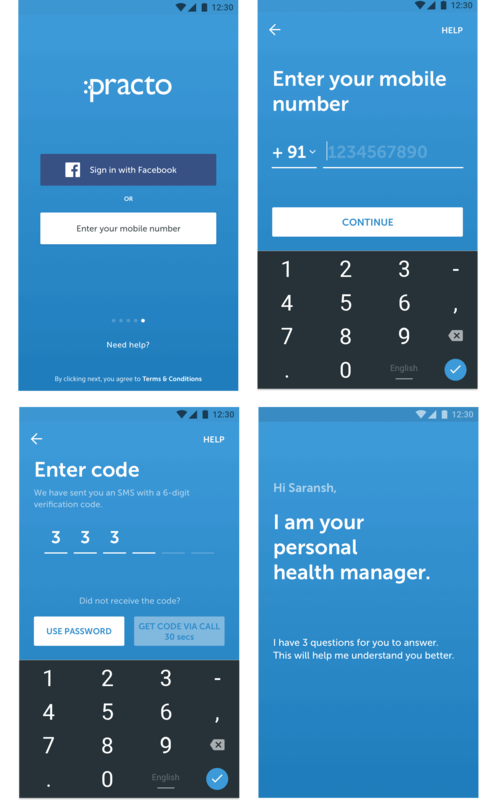 Practo makes health and fitness accessible and affordable to millions on Indians. Here I talk about its latest design overhaul. 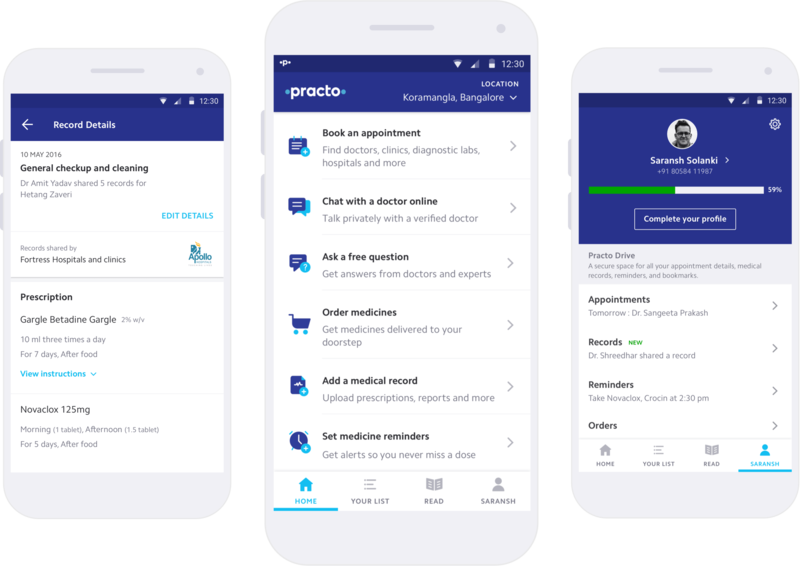 Practo brings health and fitness to your phone and in your control – be it saving and sharing your health records or booking a doctor’s appointment. All your immediate doubts get answered online by qualified doctors, while everyday health and fitness gets its fuel from exclusive expert tips. Practo has created an entire ecosystem of products to let humankind live healthier and longer lives. Healthcare providers can also harness the power of Practo as the platform that helps them build their presence, grow establishments and engage patients more deeply than ever. Practo’s mobile app is used by 4 million users across five countries. 50 million appointments are booked every year. Practo boasts of a massive set of 100,000+ verified doctors backed by 1.5 million+ patient recommendations. 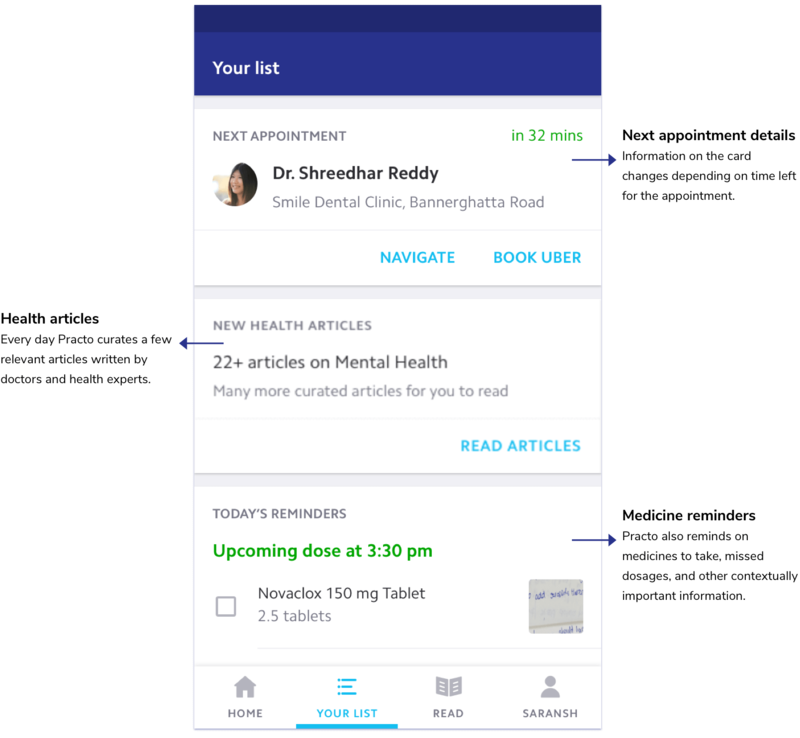 The app, which was built four years ago, has the primary objective to get health products closers to users by providing them with a much better and personalized experience. The app's growth and metrics had become stagnant. Our new features were not being adopted even though they had a wonderful customer satisfaction rating. Hence, I took up the task to understand the pain-points of the current app and created solutions to fix it. I joined Practo in January 2015 as a front-end developer and slowly started taking up more design tasks. Following then, I worked as a Product Designer working on multiple projects on various platforms (health records, appointment booking, accounts). For this project, I led a team of 8 designers. I coordinated and directed all facets of design including information-architecture, user task flows, interaction, visual, product, and prototyping. I also conducted user research using methods such as interviews, surveys, focus groups, and participatory design to address both user behavior and attitudes. Practo's app has been available in the app stores since 2013 and had been used by around 2 million users. I went through our user data and examined the engagement, transaction recurrence, and life-time-value of various user groups. I also performed a lot of market trend research and analysis to come up with our three prime user segments. The subsequent step was to learn the user stories and create an experience map. 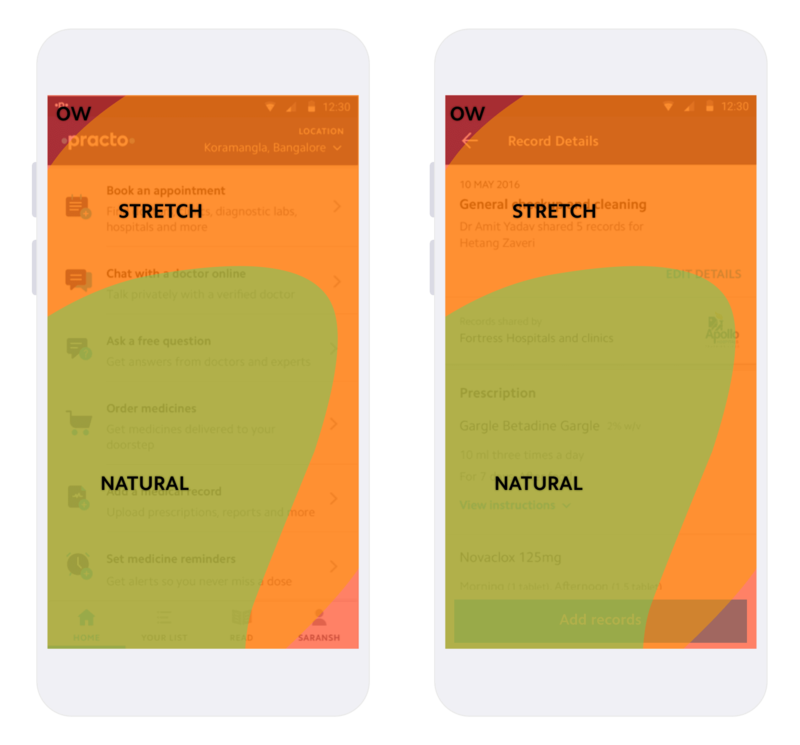 These helped us thoroughly understand the genuine difficulties for our users and ideate on ways to efficiently solve them through the health app. I used Nielsen’s ten general principles for usability. Some very prominent issues were brought up by this exercise. 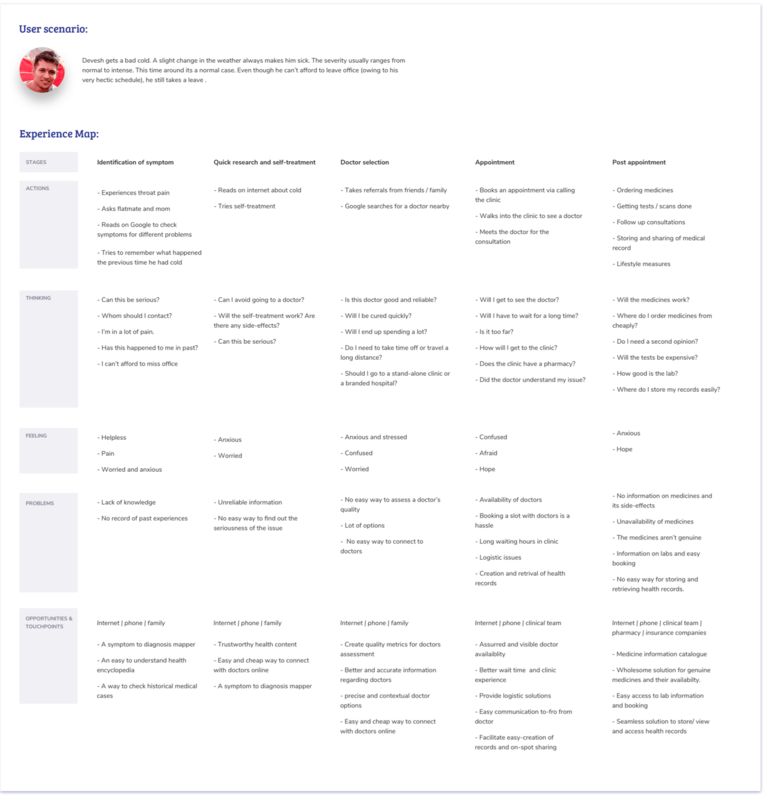 After the heuristic evaluation, I went through our existing user data, had focus group interviews, sat with our customer satisfaction team and identified a massive list of issues which troubled our users. I spent considerable time to understand the friction points with the existing app and went through all our user feedbacks and support tickets. I recognized that the applications were not working as the way our team had envisioned it to be; a helping hand in your time of medical need. 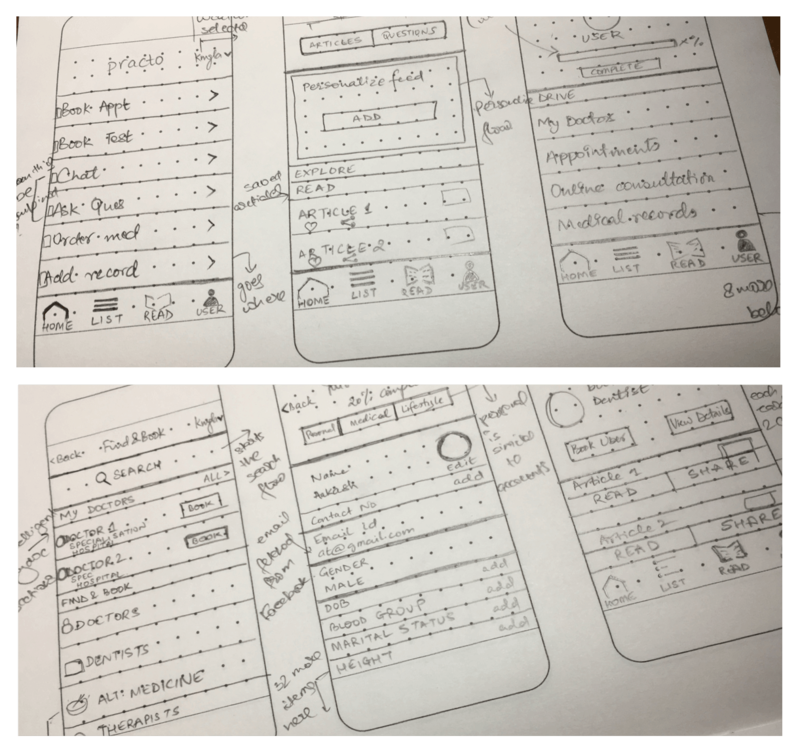 Previous app designs with linear IA. This did not map correctly to the real world scenario. Hence users were not discovering our other products. 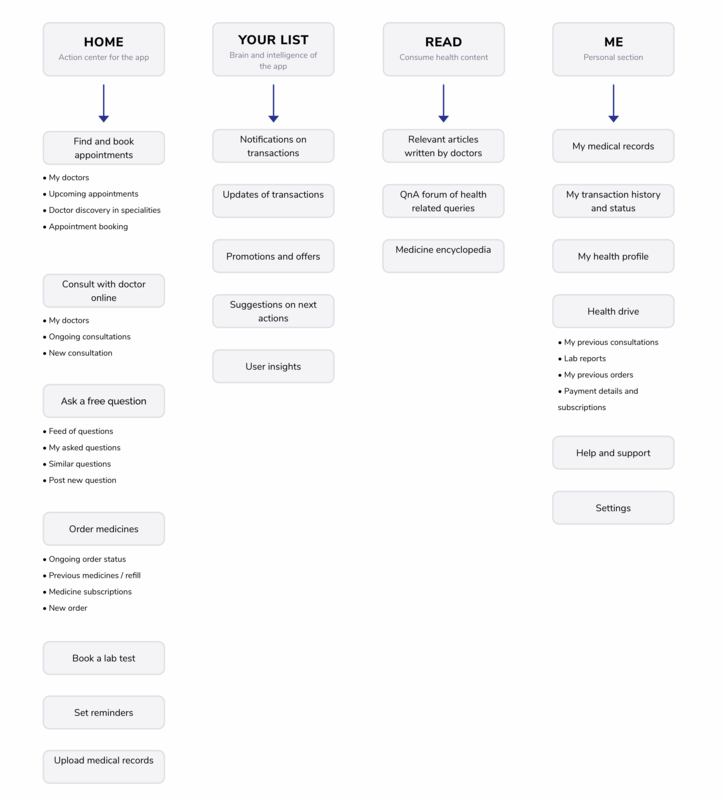 After identifying the key problem areas, I started ideating and iterating on the new app. 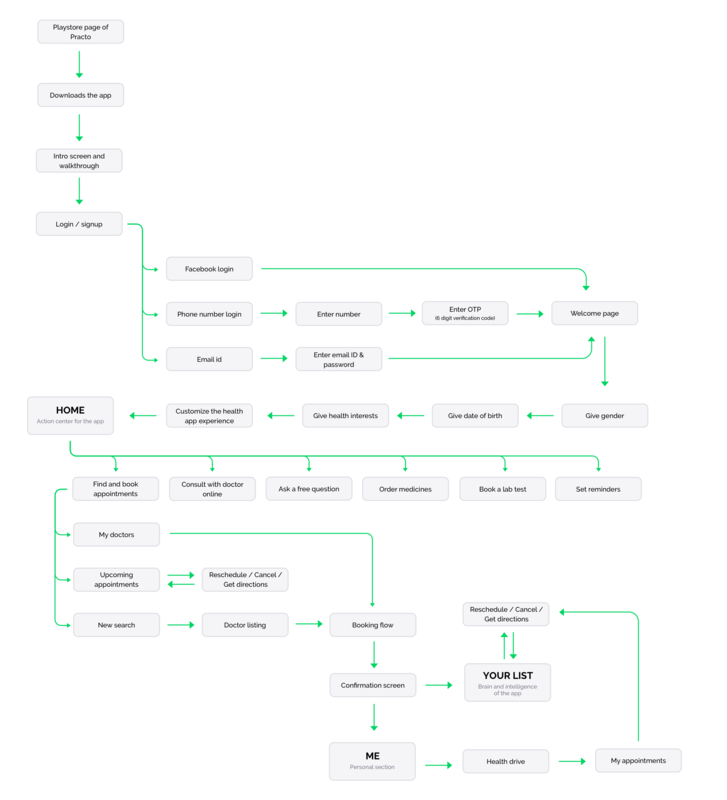 I determined the critical specs that had to be included in the app, then mapped out user flows based on those specs (much white-boarding was involved). During the process, I sat with our product and tech team and brainstormed on many ideas around the app architecture and its new features. I finally went ahead with a circular architecture which helped us tie in all the features present in the app. This linked all the transaction flows to one another, helping us replicate the real world physicalities of a medical consultation. After much brainstorming, I identified the major features/changes to be made to the app. Mandatory login: Our users are high-intent users. Making them login during the app launch makes it easy for them to enjoy the rest of the experience inside the app. Also, a lot of personalization could be performed. First-time user experience: I redesigned our on-launch experience to let users know everything about Practo's offerings. Profile and personalization: Healthcare needs to be personal, and that can only be accomplished when we understand our users better. Your list: This, as we internally say, is the "Brain" of the app. We send notifications and updates to users here. From all the user data we collect, we send them critical insights on their health and measures to be exercised upon them. Visual consistency and communication revamp: I built an exhaustive guideline and rethought the way Practo communicates to its users by removing every possible jargon. I sought to combine the login and user onboarding to implement a seamless experience for our users. 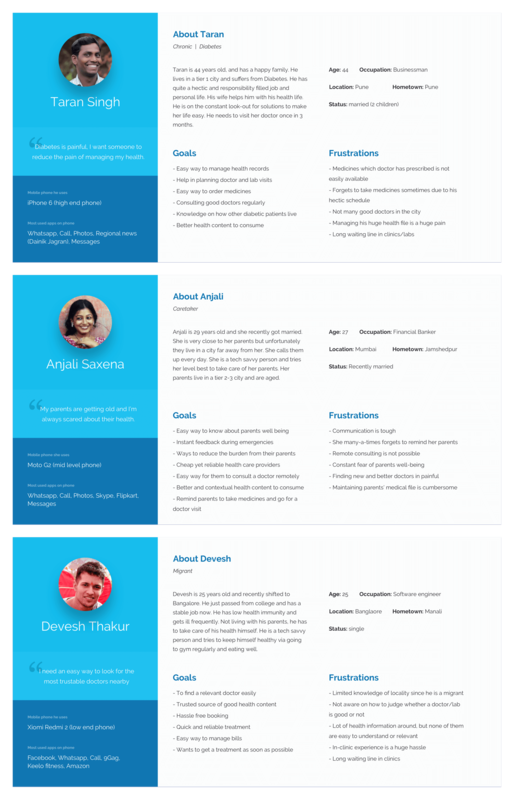 We had to market our users the advantages and offerings of Practo consequently pushing them to signup. The signup flow was rethought, making it more instinctive with lesser cognitive pressure by using complexion reduction and high-grade communication. Individually, all screens were designed in a manner that the complete first-time experience would take less than two mins for a user to complete. I went through a lot of iterations, feedbacks, and testing to come up with this final flow. I designed an OTP based login system which improved our login funnels. Users could sign in by just entering their mobile number, and the app would do the rest by automatically reading the verification code sent through the SMS. I created a comprehensive style guide. I went through all the existing screens on the app and made a list of components used. 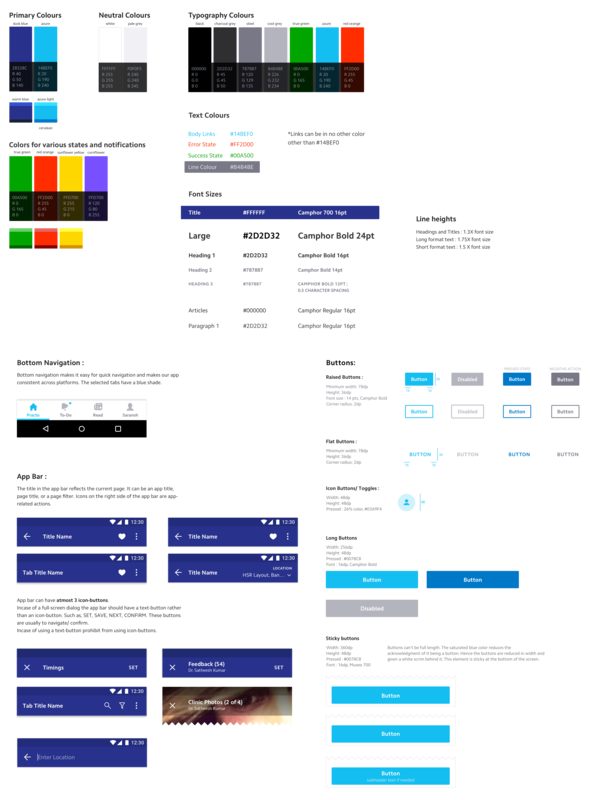 This style guide consisted of all rules, examples of usage of components and assets. At one time Practo had as many as 17 shades of brand blue been used in the app. Our aim here was to remove all of such similar inconsistencies. I made an exhaustive repository of 220 icons which is now being used by the entire tech-design-product team. SVGs were used for Android and compressed PNGs for iOS. Our technology team helped us adopt compressed and refined drawables leading to the reduction in the download size of the apps by 40% consequently helping us serve 30% more patients in India. Home: Healthcare services and functions that you can access on Practo. 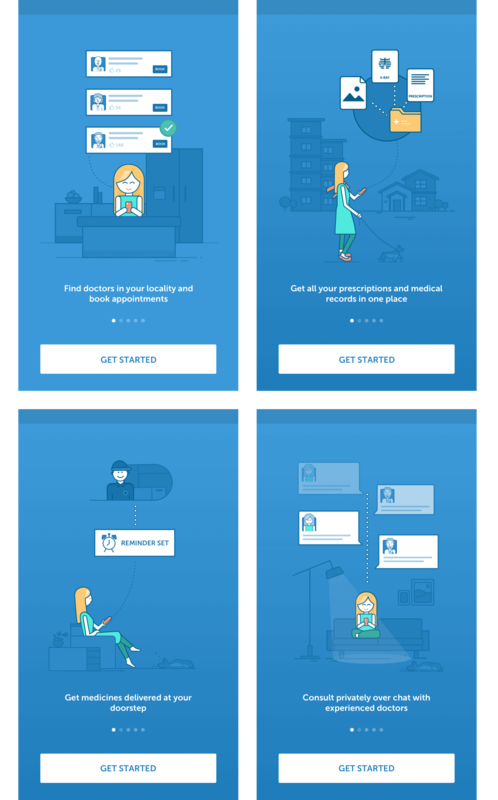 Your list: Practo’s personalized recommendations for you to stay healthy. Me: One place to securely store your medical records and maintain your health profile. "Your list" is the "Brain" of the application. With all the user data Practo collects, we understand the user's necessities and desires. Hence we were able to direct them through the health journey towards better healthcare efficiently. 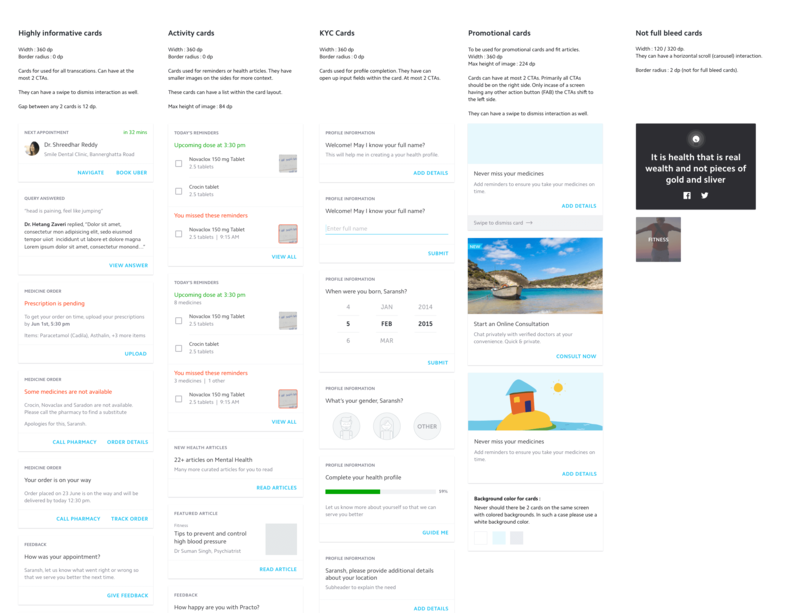 I used anticipatory design to send contextual, personalized and purposeful prompts to our users. Being able to anticipate what our users will want and need is closely related to empathy. We were able to reduce decision fatigue and create more personalized user flows. The application does not take decisions on user's behalf. Instead, minimizes superfluous interactions and let users get on with their day. This section also serves the purpose of notification center by sending the most meaningful and contextual alerts to users. I also developed a conversational UI based question wizard inside the app with the intention to complete the user’s health profile. We started with as many as 32 questions (which were all controlled by us via a sturdy backend). The flow was designed to give a consistent and easy-to-use experience to increase the fill rates of the questions. I split up the elaborate process into multiple smaller sections and placing those smaller pieces on screens of their own. It helps reduce cognitive load and load pages faster. Also, data input becomes quicker, and flow branching becomes apparent. 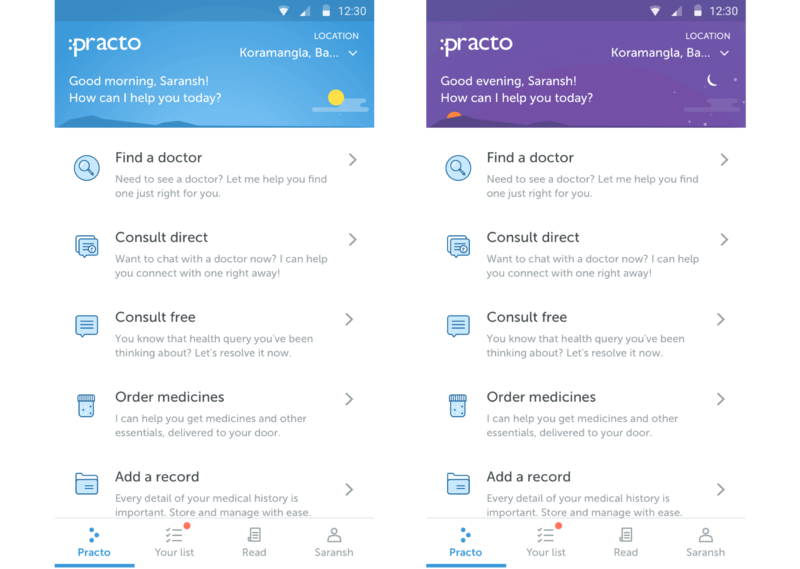 Practo recently went through a colossal brand revamp. I worked with the legendary team at Chermayeff & Geismar & Haviv to come up with our brand identity. 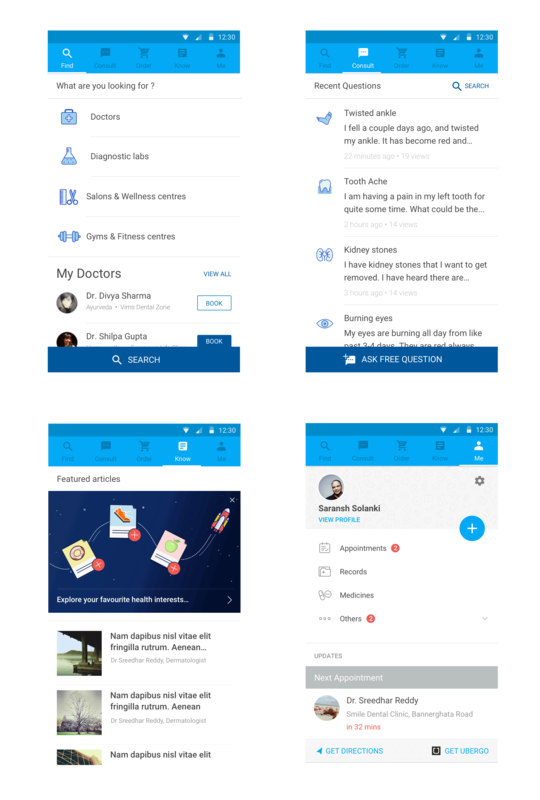 The app also went through a lot of brand refresh before the release. I worked day in and day out to get every pixel perfect. Regarding visual design, I tried to reduce any chance of ambiguity making the important aspects clearer and reducing decision fatigue. I wanted to set the expectation right for our users and let them know what the purpose of every experience I create is. The standard style guide helped in shipping things faster and with consistency. The app was exceptionally well received by our users. We received numerous encouraging reviews on social media and play store. All the core metrics which we track improved. Many issues regarding discoverability of products and first-time user onboarding were resolved to a large extent. This, almost a year-long project, has helped me understand that good product are built with human-centered thinking and is amplified when created in collaboration with people of diverse backgrounds. Bringing in the engineering team early on in the project helps things to go smoothly down the line. Also, spending a few sprints in fixing the groundwork keeps the team to move faster.